In Japan, this class of beings includes the Flying Apsara (Hiten 飛天), Celestial Maidens (天女), and the Bosatsu on Clouds (Unchū Kuyō Bosatsu 雲中供養菩薩). The Sanskrit term for these celestial beings is APSARA -- it refers to the divine beauties and dancers who populated Lord Indra’s court in Hindu mythology. In Japan, the term APSARA is rendered as TENNIN (celestial beings), a group that also includes the TENNYO (heavenly maidens). These heavenly beings are not generally worshipped as Buddhist divinities. Rather, they serve as acolytes to the gods, and appear often as decorative elements in Buddhist temples, sculpture, painting, and religious clothing. Sometimes, however, the TENNIN are treated as BOSATSU (Bodhisattva) -- the topic of this side page !! please see the main MAIN TENNIN / TENNYO page. Byōdō-in also spelled Byodo-in, Byodoin, Byoudou-in. Exploring the Beauty of Japan #45 (March 18, 2003). The Uji region, where Byōdō-in Temple is located, was a popular area for the aristocracy to build their country villas during the early Heian period. In 998, a historic villa in Uji, originally built by Minamoto-no-Toru and later passed on to Emperor Uda, was acquired by Fujiwara-no-Michinaga. Michinaga often stayed at this villa, and organized literary gatherings with poets and writers. When Michinaga died in 1027, this villa, which had been nicknamed "Uji-dono," became the property of his son Yorimichi. In 1052, which was considered the first year of the latter days of the dharma (the last of the three periods after the Buddha's death), Yorimichi converted Uji-dono into a temple, known as Byōdō-in. In 1053, Yorimichi constructed the Amida Hall. In later years the Amida Hall came to be called the Phoenix Hall, either because the hall’s shape is reminiscent of the mythical bird or because a pair of phoenixes adorn each end of the roof. The main object of worship is Amida Nyorai. Fifty-two worshiping bodhisattvas on clouds adorn the frieze area surrounding the statue. Made by the great sculptor Jouchou 定朝 (d. 1057) and his pupils, these same artists are also believed to be responsible for the original models of the elegant gilt bronze phoenixes that adorn the main roof. Painted on doors and walls of the hall were RAIGO scenes (scenes of Amida Nyorai descending from the celestial realm to welcome the spirit of deceased believers into the Pure Land). These scenes are based on the concept of KUBON OUJOU (nine categories of rebirth in the Pure Land) as explained in the Kanmuryoujukyou (Sutra of Contemplation on the Buddha of Eternal Life). Although construction at Byōdō-in Temple was continued with much enthusiasm by Yorimichi and his clan, the temple gradually began to decline in the Kamakura period. In 1231, Fujiwara-no-Sadaie (Teika), who visited Byōdō-in Temple on his way back from Kasuga Shrine in Nara, lamented its sorry state of disrepair in his diary, Meigetsu-ki. While repairs were later carried out, Byōdō-in Temple was subsequently dealt its worst blow by the wars of the Nambokuchō period. Embroiled in the war in 1336, almost all the temple's halls and pagodas, except for the Phoenix Hall and a few other buildings, were burned to the ground. The fortunes of Byōdō-in Temple declined even further during the Muromachi period. Efforts were made to raise funds for repairs, as can be seen from an appeal for contributions written by Sanjonishi Sanetaka and dated April 1500. Votive tablets left by worshippers also reveal that from around this time, Byōdō-in Temple became a place of worship for commoners. During the Edo period, major repairs were done mainly on the Phoenix Hall in the Kambun and Empo eras (1661-1681). The north and west temple gates, however, were destroyed in the great fire of Uji in 1698. The temple must have then been left in disrepair for some time, for the doors and walls of the Phoenix Hall are covered with graffiti. Byōdō-in Temple, North Side, #14, Height 53 cm. Bosatsu, or Bodhisattva, are enlightened beings who forgo the Pure Land out of the desire to save others. This definition of the Bosatsu was vigorously promoted by the Mahayana school to differentiate itself from the Theravada tradition. 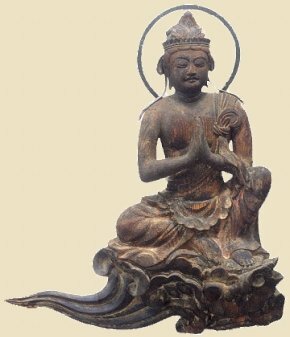 The type of Buddhism practiced in Japan is primarily Mahayana. 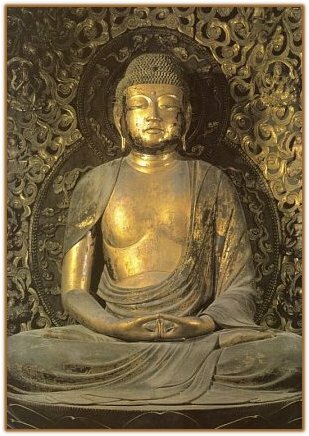 Click here for details on the difference between the Mahayana and Theravada schools, or visit the Bosatsu Intro page for details on Japan’s most widely known Bosatsu. Twenty-six are placed on the north wall and 26 on the south wall, as if to surround the Amida image, which faces east. All but one have been numbered for convenience -- i.e., North 1 to 26 and South 1 to 25 -- for the unnumbered image was supposedly found outside the Main Hall after the others were listed as National Treasures in 1904. Many of the original statues have had damaged or missing replaced. 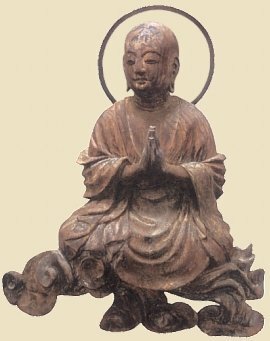 Jōchō, the sculptor of Buddhist artifacts who was responsible for these figures, was active through the first half of the 11th century. He is credited with the carving of many of the Buddhist images at Hōjō-ji Temple 法成寺 in Kyoto as well. Hōjō-ji Temple 法成寺 was founded in 1020 AD by Fujiwara-no-Michinaga, the father of Fujiwara-no-Yorimichi, but it is no longer standing -- it was lost around the 14th century. For his work at Houjouji (around 1022 AD), in particular the carved images in the main hall and the Godai-do (Hall of the Five Great Wrathful Gods), Jōchō became the first Buddhist sculptor to receive the distinguished Buddhist title, Hokkyo. His statues served as paragons of Buddhist images for centuries afterward. Jōchō died in 1057+. 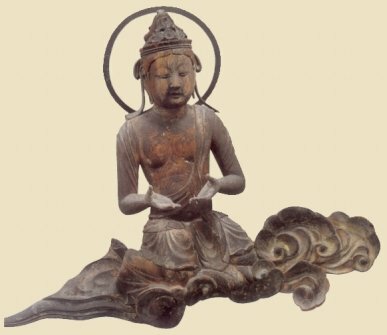 Since the Amida statue and the Bosatsu on Clouds in the Phoenix Hall were created in his last years, these pieces probably represent the pinnacle of his achievements as a Buddhist sculptor. Jōchō’s achievements in woodcarving techniques were considerable. He is credited with perfection of the assmbled-wood technique (Yosegi-zukuri 寄木造) and the split-and-join method (Warihagi-zukuri 割矧造) of sculpture. Single woodblock construction (Ichiboku-zukuri 一木造), in which the entire statue or at least the head and torso were carved from a single piece of wood, was the preferred method of sculpture until the 11th century. However, the size of the statue that can be created by this method is limited, and even a life-size statue is very heavy. A wooden core can also be a source of large cracks that spread through the statue as the timber dries. While the problems of weight and cracking can be overcome to a certain extent by hollowing out the interior of the statue from the rear and base, the size of the statue is limited. The assmbled-wood technique and the split-and-join method developed as solutions to the limitations of single-block sculpting. A wood sculpture construction technique in which the main part of a statue (the head and torso) are made from a single block of wood. The term is used even if the hands, arms, or knees of a seated figure, are made separately and joined to the single-block main body. In many cases, however, projecting limbs and even a part or the whole pedestal may be carved from the same block. Many more details here (outside link). 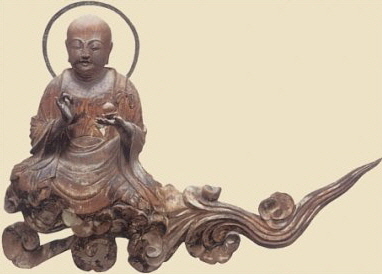 Although the assmbled-wood technique was already being used in the 7th century, Jōchō brought it to the level of perfection as a wood-sculpture technique. 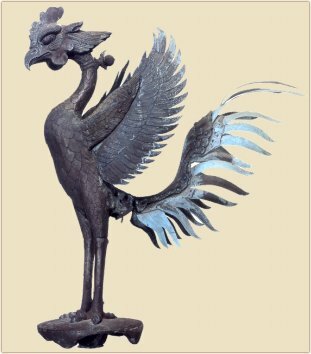 The archetype of this method is visible as the Amida image in the Phoenix Hall. Here, the head and torso were carved from blocks about 40 centimeters thick, two in front and two behind; the knees are of two horizontal blocks, while the arms are made of different timber again. The inside has been hollowed out, leaving only a thin layer of wood. With the assmbled-wood technique, the head is usually removed at the neck and later rejoined to the torso. For the Phoenix Hall image, this was done only for the two blocks at the rear, not for the front. The assmbled-wood technique allows creation of large statues through joining of various pieces. Division of work is also possible as sections of the statue can be carved separately before assembly. A benefit of this method is the ability to produce large quantities of statues with standard specifications. Fujiwara-no-Michinaga founded Houjouji Temple, and his son, Yorimichi, continued construction after his father’s death. While the temple no longer exists, it is known that more than 200 wooden statues were created there, including many over nine meters high. 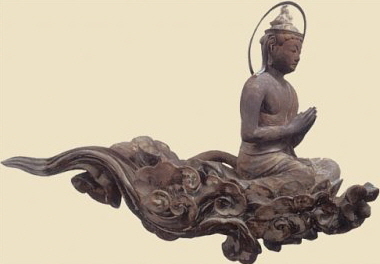 Development of the assembled-wood technique therefore satisfied the conditions for the notable mass-production and growth in physical size of Buddhist statues from the time of Michinaga onward. The split-and-join method of wood sculpting was perfected almost at the same time as the assembly technique. Here, the head and torso are carved from one block. The block is then split along the grain at a suitable point to enable hollowing of the interior, after which the pieces are rejoined. As in the assembled-wood technique, the head may also be removed from the torso and later reattached. Split-and-join is suitable for making statues that are smaller than life-size. This method was probably developed to enable maximum reduction in weight, while retaining the original, single-block method of wood sculpture. The Bosatsu on Clouds offer many classic examples of both the split-and-join method and the assembled-wood technique. 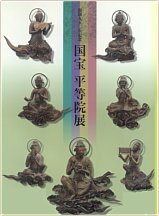 The rich variety of styles and techniques evident in the Bosatsu on Clouds hints at diversity among the sculptors who created them. Some time before establishment of the Phoenix Hall in 1053 AD, the Heian-period statesman Minamoto-no-Tsuneyori mentioned in his diary (Sakeiki) that Jōchō was carving 27 Buddhist images as offerings for childbirth by Empress Ishi, wife of Emperor Goichijo. At the time, around 1026 AD, Jōchō had 20 master sculptors working under him. He and each of the master sculptors had five lesser sculptors working under their direction. Jōchō thus appears to have had a large organization of Buddhist sculptors at his disposal. It can be supposed that by the time work began on the Bosatsu on Clouds at Byōdō-in Temple, this organization had evolved considerably. 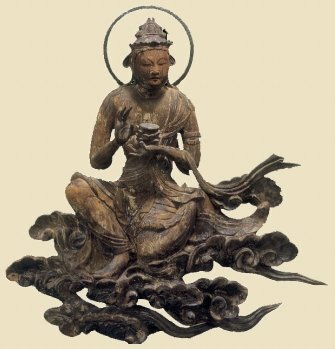 Yet, the variety of styles and techniques evident in these statues suggests they were the outcome of each master’s personal touch, and that we cannot suppose Jōchō’s authority restricted individual creativity. This may be the origin of the captivating attraction of the Bosatsu on Clouds. There is no information on how the Bosatsu on Clouds were arranged or how many statues there were originally. In seeking an answer to this question, researchers have been drawn to ink characters that are still visible on a number of the statues. The presence of names revered in Mikkyō (Esoteric) Buddhism suggests an arrangement in line with Mikkyō concepts. However, there is not enough information at present to allow any definitive explanation. All of the above examples were associated with Empress Kōmyō 光明. However, the heavenly beings on the walls of the Amida Jodo-in Hall (Hokke-ji Temple) are particularly significant for their resemblance to the Bosatsu on Clouds at Byōdō-in. A connection may thus be drawn between the concept of the Bosatsu at Byōdō-in to earlier examples of the Nara period. There are also fascinating similarities between Bosatsu images drawn on linen stored in the Shosoin (the wooden storehouse within Todai-ji Temple), and the forms of the Bosatsu seated or standing on the clouds, as well as the clouds themselves. It has also been pointed out that the arc-shaped decorations on the garlands adorning South 3, 7, and 10 bear striking resemblance to carvings of the 7th and 8th centuries (Bosatsu images on lotus petals on the base of the Great Buddha, in Tōdai-ji Temple 東大寺, for example). 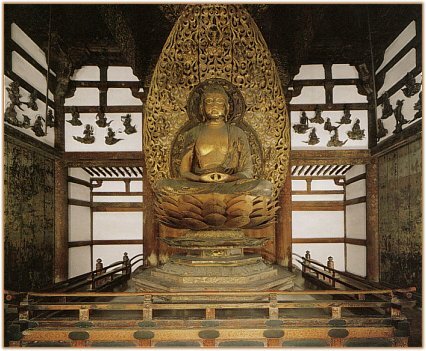 There is thus ample evidence to suggest that the Bosatsu on Cloud concept at Byōdō-in was based partly on earlier examples of the Nara Period, particularly the images in the Amida Jodo-in Hall at Hokke-ji Temple. Jōchō had associations with temples of Nara. He was, for example, involved in restoration of statues for Kofuku-ji Temple. He also created the Joroku Shaka statue in Yakushi-ji Temple, modeling it on a famous image of Shaka in Daian-ji Temple. The impact of earlier sculptures in Nara on Jōchō’s style is frequently mentioned. This argument appears to be valid also for the Bosatsu on Clouds. and Nissha Printing Co. Ltd. Some photos on this page were scanned from this book. 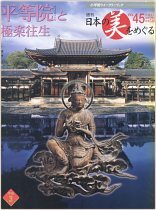 Wonderful magazine featuring treasures of Byōdō-in Temple. Some photos at this site were scanned from this magazine. Tennin and Tennyo. Celestial Maidens in Japanese artwork. This site. Tenbu (Deva) Main Menu. This site. Lists nearly 80 deities. Dunhuang Caves in China ( 敦煌 Jp. Tonko). This Site. Various photos and stories on the Apsara at Dunhuang. 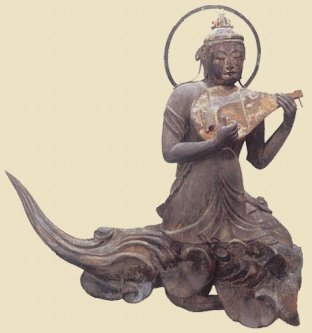 Data on the Mo-kao (Mogao) Caves & the Apsara of Music. Apsara appear often in the stone carvings at the Angkor Watt ruins in Cambodia. Visit this outside link for a few photos. At Kakuonji Temple in Kamakura, a large statue of Yakushi Nyorai is flanked by two bosatsu, Nikko (sun) and Gakko (moon). The latter two statues are adorned with Karyoubinga images. These statues were carved in 1422 AD by a local sculptor named Choyu. 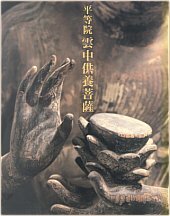 Highly recommended for those interested in Buddhist sculputure. Tours given daily. No photos allowed. Please see Gabi Greve’s page for many more photos of the Apsara paintings found in the caves of Dunhuang, China. Outside link. said to dwell in Svarga, the paradise of Lord Indra. Copyright 1995 - 2014. Mark Schumacher. Email Mark.